The Government’s mechanism to calculate the compensation rate for residents whose land it takes for public purposes is "detached" from the market value instead of relying on it, leading to prolonged opposition and grievances from those affected. Such was the unanimous consensus by experts who gathered last week at a conference held in Hanoi on land policies and regulations, one of the ‘hot button’ issue as the country undergoes a boom in infrastructure development. Assoc. Prof. Ngo Tri Long, an economist, claimed that the Government’s limit on how much it is willing to pay only equals 20-30 percent of the market value. “The low compensation makes those who have their land expropriated feel unhappy and unwilling to co-operate during the land clearance process. During any project, land clearance is always one of the biggest bottlenecks that severely delays progress,” Long said. In Vietnam, the Constitution does not recognise the private ownership of land but insist that land is owned by ’all people’, and the State is to represent this public ownership, managing the allocation of land use rights to individuals or organisations and the transfer of land use rights. According to a report from the Supreme Court in 2017, the lion’s share of mass complaints is land-related, with 74.6 percent of the cases the courts undertake having to do with land disputes. 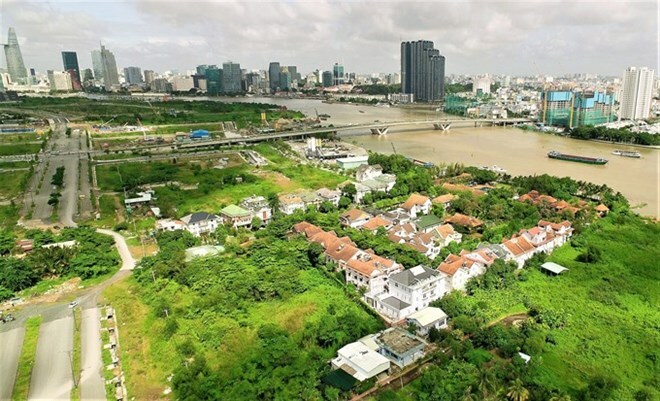 The Hanoi People’s Committee’s Decision No 96 determines the land price along several streets – including Hang Dao, Hang Ngang and Le Thai To – in the popular Old Quarter and nearby downtown area at 100-160 million VND (4,300-6,000 USD) per sq.m. These figures are already among the highest in the country, but are only a fraction of the real market value. Each square metre of property along these streets could easily reach 500-800 million VND, or even 1 billion VND, depending on the location. The controversy that besieges the new Thu Thiem urban area in HCM City, which was originally envisioned to be one of the most modern and developed urban areas in Southeast Asia, is a typical case where inadequate compensation for residents triggered mass protests and a sprawling lawsuit that has endured for more than 20 years. “The entire land valuation process is being carried out by State administration agencies, sidelining the very ones who have their land expropriated,” Long said, adding that in most cases, the land compensation rate is arbitrary, without independent input. The land law is an attempt to close the gap between what the Government could reasonably pay as compensation so as not to go over budget and the “market value," but no clear definition for the term has been reached, Assoc. Prof. Hoang Van Cuong, Vice Rector of the National Economics University and a National Assembly deputy said. “Residents of course want the ‘market value’ to be as close as possible to prevailing transactions in the area," he said, adding that the Government has not found any viable land valuation mechanism to balance its interests and those of affected people. Another land-related issue highlighted at the conference is the management and use of public land, which has come under scrutiny after the exposure of how lax supervision and legal loopholes have led to severe losses of State assets and undermined the transparency of the real estate market. Le Hoang Chau, Chairman of the HCM City Real Estate Association, pointed to selling State-owned land use rights to investors without going through a public bidding procedure, underselling State land via obscurity-plagued equitisation of State-owned enterprises or via the Build-Transfer (BT) model where the developers would receive certain land areas for a public-use project they undertake, as usual ways for losses to happen. There are also cases where State agencies or organisations partner up with private businesses to develop or carry out projects on the public land allocated to them, but the new land use price is not updated when the land is now used for commercial purposes. Chau urged the Government to soon issue a decree on the use of State assets, especially land, to have a clear legal framework to pay the correct value of land use rights to the projects’ investors that is commensurate with their expenditures. Nguyen Van Xa, former head of the public asset management department under the finance ministry, said legal issues and violations of the law undermine the gains from land, a highly valuable resource. “One thing needs to be clear, selling of State-owned land use rights must be done through a public, open bidding procedure,” Xa said. At the conference, experts urged the early implementation of the national land management database where information could be accessed in a convenient and transparent manner by any citizen or interested business. The Government would also need to come up with detailed mechanisms that enable non-State actors, especially the public, to monitor the land-related policies and raise the accountability of State agencies and officials in their decision-making.